The Manitoba MMIWG Coalition is one of four parties with standing from the province giving final submissions this week to the National Inquiry into missing and murdered Indigenous women and girls. A picture of two young girls leaning on their mother's gravestone was prominently displayed as a Manitoba group gave its final submission to the National Inquiry into Missing and Murdered Indigenous Women and Girls Monday. The Manitoba MMIWG Coalition said the ongoing loss these children feel is what needs to be remembered as the inquiry comes to a close this week in Ottawa. "Those children deserve a mother," said Catherine Dunn, who is the coalition's lawyer. "All Indigenous women, all Indigenous girls deserve to live a life in Canada like every other Canadian, but it has not happened." The national inquiry was called in December 2015 and the terms of reference and commissioners were announced in August 2016. In total, it's heard from more than 1,484 families and survivors across Canada. Parties with standing are giving their closing submissions and written recommendations this week in Ottawa. This is the final public hearing and commissioners are expected to submit their final report to government by April 30. 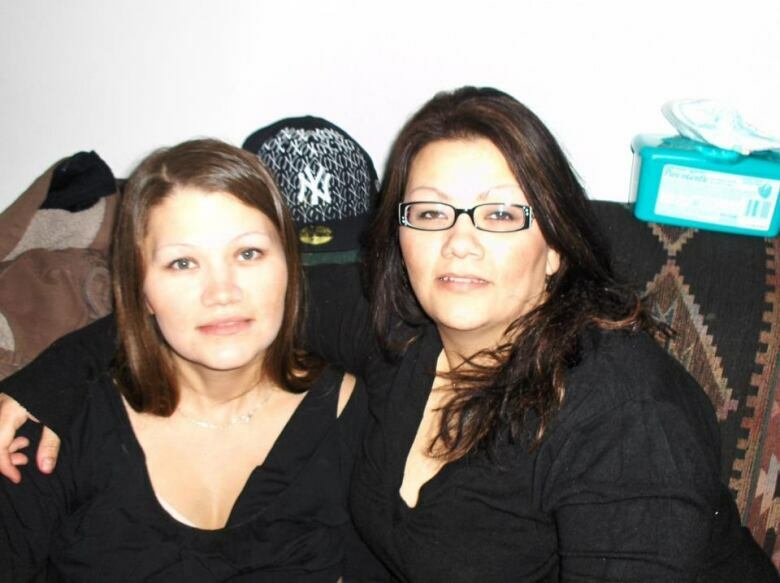 "I'm really hopeful but there is political will within the Canadian government to take all of the recommendations and put them into action," said Hilda Anderson-Pyrz, who is the aunt of the girls in the photo. Her sister Dawn Anderson was found frozen to death in Leaf Rapids, Man. in November 2011, leaving behind two young daughters. The 37-year-old's death was deemed not suspicious by police, but her family testified at the Thompson hearing in February that her body was covered in bruises when she died. Anderson-Pyrz, who is also the co-chair of the Manitoba MMIWG Coalition, said the decision was not made lightly to submit her niece's photo into evidence for the inquiry. "Often the children who are left behind are forgotten and there's no real supports or resources for those children," said Anderson-Pyrz. "We need to make Canadians aware that there is such a great need to provide supports and resources to families and survivors who've been impacted by violence." The coalition has been one of the most critical voices during the inquiry process. Last summer it called for the commissioner's resignation and said the inquiry needed a hard reset. "You've kept our feet to the fire," said Commissioner Qajaq Robinson said in Ottawa Monday following Dunn's submission. "We speak of accountability and keeping the heart of the inquiry focused and your clients have been instrumental for me." While the four commissioners retained their posts, Anderson-Pyrz said she felt like they took the coalition's concerns seriously. "I wouldn't say 100 per cent of everything that we said, but they did take a lot of our recommendations to try to create a better space for the national inquiry." Although she said she sees the inquiry as a fractured process, other families and survivors have found healing in sharing their stories. She said the time to be critical of the inquiry is over. Instead, they'll focus on holding the government to account when it receives the final recommendations from the commissioners. "To see like every day across Canada there's an Indigenous woman or girl who has gone missing or who has been murdered ... I think really speaks volumes that the federal government needs to step it up and needs to have that political will to help end violence against Indigenous women and girls," said Anderson-Pyrz. 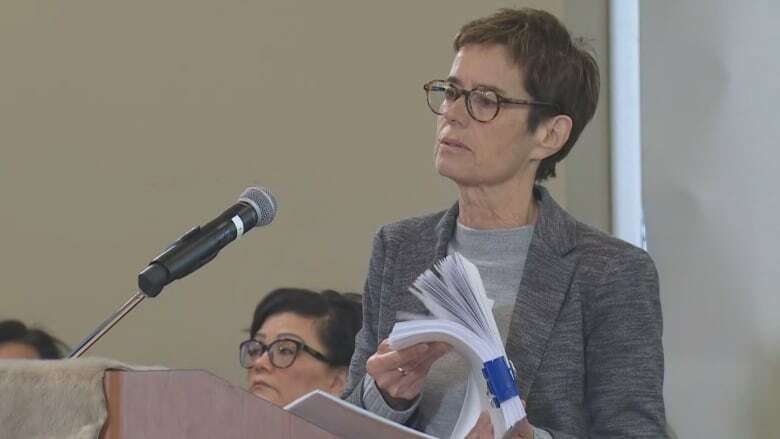 At one point in her 40-minute submission, Dunn held up a thick stack of paper, which she said contained 1,200 recommendations previously made to the government on MMIWG. "A pathway for change doesn't come from laws, it comes from political will," she said, about prior recommendations not being acted upon by government. The commissioners heard from the Assembly of Manitoba Chiefs on Monday. The Winnipeg Police Service will speak on Wednesday and Manitoba Keewatinowi Okimakanak on Friday. Could you spend seven and a half years wondering where your daughter is?